Eyes: Originally green-blue; the TF radiation he/she has absorbed has turned them a bright green. He/she wears spectacles that have no apparent side pieces, which makes people wonder about how they stay in place. Clothing: Her usual outfit consists of cargo pants and a red t-shirt with a stylized green flame on the front, although she has been seen in a dark red one-piece swimsuit (as shown here). In LPW, she has a wardrobe of different outfits, courtesy of the Rack of Infinite Clothing, although she is equally comfortable in just her fur. General personality: KF-Oz can be a bit wild and "out there", but usually prefers to hang back a bit and watch before committing to a course of action. Generally friendly and helpful to others, especially people in trouble. Has a good sense of humor, and a fondness for bad puns. Tends to take pretty much everything in stride, no matter how surreal it gets (and in the environment of the KeenFans RP, that's something of an achievement!). This also makes her immune to panic. Basics: KF-Oz has the usual abilities associated with cat-people: "cat-like" reactions, agility and speed, will always land on her feet from a fall, and has excellent night-vision. Her hearing and sense of smell are much better than those of most humans. Her tail is fully prehensile, and is (almost) strong enough to support her own body weight. She has retractile claws on both hands and feet. She is somewhat stronger than a human of similar size, due to her denser muscles. Object Summoning: She has the ability to produce objects, apparently from thin air, at will. She has no idea how this works, but suspects it involves a variant of Hammerspace known as "Plotspace". The limits of this ability seem to be that she cannot Summon anything alive, nor can she Summon anything larger or more massive than her own body. The sole exception to this rule is the Rack Of Infinite Clothing. She can UnSummon objects the same way. Flame Aura: Due to the combination of TF energies and magic that he/she has been subjected to (including a Faerie Fire spell cast on her by Drow Bunny), she has an aura of green flames surrounding her body. This aura, which apparently responds to her thoughts, gives her transformational powers, although so far it seems she can only turn people into catgirls (i.e. female anthrofelines). The aura is normally nearly invisible in daylight, unless she is actively using her power. She has also used her magic flames to reheat pizzas, and to create "hard-light" objects, in the style of a Green Lantern. She suspects she could possibly do other things with them, but as yet she has no idea what. Immortality/Healing Factor: KF-Oz is immortal, although not invulnerable (much like "Highlander"-style immortality). If injured, she will heal much faster than a human. Convenient Door: Similar to Kum-El's Convenient Skylight (although not related), she can make any door lead to wherever she wants to go. If necessary, she can even create her own door, although this is more difficult. Other abilities seem to manifest according to plot requirements (and depend on what local "environments" allow). In LPW, for example, she has OOC Awareness bordering on omniscience. Originally, the male <OzLionHeart> made a debut in the first incarnation of the KeenFans RP, although in truth he didn't play a large part, partly due to his player's (then) inexperience with RPing. When the RP died, he returned to "inactive character" status, until the reboot in KeenFans RP 2.01. Entering the thread by his usual method (creating a "Convenient Door"), he entered the KeenFans RP 2.01, and proceeded to take up largely where he left off, except that this time he now had a new gimmick: the ability to produce objects from thin air by snapping his fingers. When a TF bomb went off (somewhere around the bottom of Page 2), he was transformed into a she. She chose to remain female, rather than change back as many of the others did. During the pool party that broke out somewhere in the middle of things, a magical duel took place, and <fOzLionHeart> acquired purple hair and dark red stripes from being caught in the crossfire. Another TF bomb gave her the aura of green flames, which became permanent due to the spell cast on her by Drow Bunny. 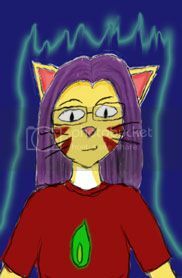 She first appeared in LPW during an apparent stalling-out of the now-deceased KeenFans RP, where she began calling herself "KF-Oz". This is her preferred name now. She has become a sort of "den mother" to the folks who inhabit the Pavilion, including the Lommies, and the other catgirls there. She transformed Courtney Daymine into an anthrofeline at her own request, and later made the transformation permanent. She has also made appearances in various "celebration" or "party" threads, mostly when called on by her "boss" to TF Burningblood whenever he threatens to perform his strip act, and on one occasion in the original KMA Thread, when she rescued Lomgren from a deathtrap. She has appeared in all three incarnations of Mayhem: It's All For Real. This version of her has been referred to by her Author as "IC-Oz". She has appeared at the Tzevaot in Fort Mayhem, as the representative/avatar of her Author. A version of her became the base for Cory Deleon's physical form. This page was last modified on 27 March 2010, at 07:26.